Happy April Fool’s Day Monday! I promise this week’s blog/vlog ONLY features tips and NO tricks! For as long as I’ve been doing blogs/vlogs, I’ve been asked about tips for improving grip strength. For those of you who are into doing deadlifts, the dividing line between men and boys seems to be three plates per side or about 315 pounds. Why? Typically, you can’t add more plates unless you do some type of grip training. From time-to-time, there are exceptions with people who have naturally strong grips. This week, I’ll show you how to condition your grip with the farmer’s carry, a technique I learned from my younger days working on a farm where we used wheelbarrows and tools and handled rocks and bales of hay every day, instead of dumbbells and kettlebells. The farmer’s carry is a good way to improve grip strength for an anaerobic activity like a 1-4 rep maximum on a deadlift. First, you’ll do a proper warmup — you don’t want to hurt yourself — and want to use a maximum weight that you can carry for no more than 8-12 seconds. 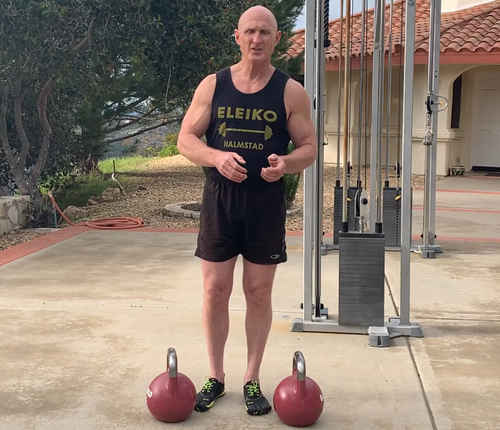 If you want to extend the strengthening effect, you’ll want to use a weight that’s 5-10 pounds lighter, carry it for as long as you can and put it down, then repeat the process until you can’t open your fingers any more. This is called a drop-set. You can carry one dumbbell or kettlebell per hand or just one at a time. Just be careful because using just one weight will place an extra frontal plane load on you going side-to-side and you don’t want to overload your quadratus lumborum or oblique muscles. Simply pick up the weight(s), maintain a good upright posture and don’t slouch or let your shoulders drop forward. Hold that weight steady with proper posture so you can feel it through your spine and down to your feet. Give yourself enough rest between the days you perform this exercise so that you can improve your performance from 1-3 percent each time. If you’re into sports like rock climbing or want to do chin-ups for as long as you can, using the drop-set method is really critical. But, if your only goal is to improve your performance in the deadlift with a heavy weight, you don’t have to perform the farmer’s carry for more than 12 seconds. Your optimal range of time carrying that weight will depend on your proportion of slow- and fast-twitch fibers and conditioning, just to name a pair of factors. I hope the farmer’s carry helps you improve your ability to lift heavy weights or just be more mobile, so long as you stay safe and don’t overdo it!